The season everyone waits for is around the corner. No, not Christmas, Santa is coming - but not yet. December ONLY - Artist of your Choice - Booked for the Day! Our all-day-deal year round is $700 and our gift to you for the holidays is taking $200 off of that! Any tattoo, any size, anywhere. Colour, black and grey, sleeve, back piece, unfinished projects, or maybe you just want to show up with a couple of your friends who all want to get tattooed. Whatever you've been hoping for, but thought you could never afford. The only limit is how much you can take! 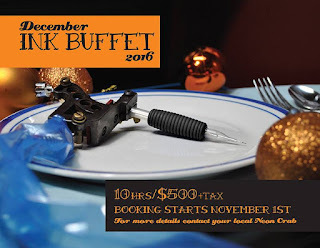 But hurry, these days are limited in quantity and book up quickly as each artist has a select amount of days available for buffets (and we have Christmas holidays during December as well). So save your nickles, $565 worth, and pop in after November 1st to book yourself an ink buffet! For more details, pop on in or give us a call!